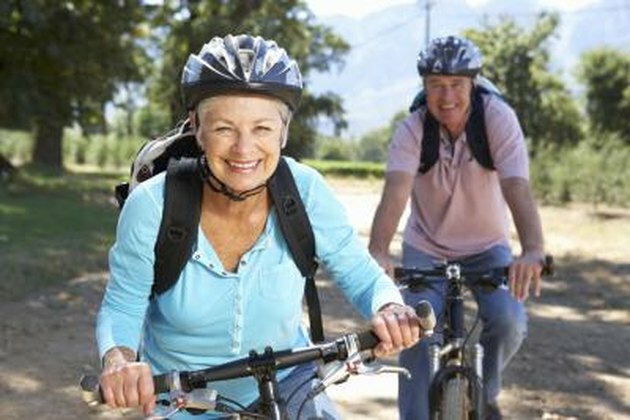 Seniors over the age of 60 may increase their life expectancy by staying physically active and exercising regularly. By creating a workout that includes exercises to build endurance, strength and balance, seniors can help reduce the risk of falling. Not only that, regular exercise can lower the chances of developing arthritis and chronic illnesses such as heart disease and diabetes. Make an appointment with your family physician for a checkup before beginning any new exercise program. Stretching before a workout reduces the risk of injury and prepares your body for more strenuous exercises. Stretch slowly and gently -- avoid bouncing and stop if the stretch becomes painful. To loosen the muscles in the front of your thighs --the quadriceps -- lean against a wall, grab hold of one foot and pull your heel toward your buttock. Stretch your calf by leaning your forearms against a wall. Take a step back with one foot, straighten that leg and bend the front leg slightly. Repeat on the other side. Loosen your upper body by raising your arms over your head and clasping your fingers together. Pull your arms back slightly and with your fingers still clasped, open your palms toward the ceiling. Aerobic activities increase your stamina, help maintain weight and can improve the function of your heart and lungs. Perform an aerobic activity at a moderately-intense level for 30 minutes, five to seven days a week. Walking, bicycling, low-impact aerobic classes, swimming and jogging are ideal aerobic activities that raise your heart and breathing rates for an extended period. Dancing, raking leaves and sweeping also help increase your heart rate and help burn calories. Avoid overdoing it at first and start by doing just 10 minutes at a time; gradually build up to the recommended 30 minutes of activity. The Centers for Disease Control and Prevention states that strength exercises may help reduce the symptoms of arthritis, osteoporosis and diabetes, as well as ease lower back pain. Use your own body weight, small hand weights or resistance bands to strengthen muscles. Biceps curls help build stronger arms. Clasp a weight in each hand and hold your arms straight down in front of you. Slowly raise your hands until the weight touch your biceps; lower and repeat. Back leg raises strengthen your back and buttocks. Grasp the back of a chair as you slowly lift one leg straight back. Hold that position for a second and release. Repeat on the other leg. Strengthen your arms by doing chair dips. Sit in a chair with arm rests. Slowly raise your body off the chair with your arms and hold for one second; then lower your body back into the chair. Balance exercises can help prevent falls that cause broken hips and other life-changing injuries by improving your ability to maintain control of your body. Improve your balance by standing on one foot as you hold on to a chair. Maintain the position for 10 seconds. Repeat 10 to 15 times on each leg. Walking heel to toe -- placing one foot directly in front of the other for 20 paces -- helps with balance issues. Perform the balance walk by raising arms to shoulder height, focus on a spot ahead of you and walk slowly forward by lifting your back leg toward your chest. Pause for one second before taking the next step. Repeat for 20 paces.